No adventure is impossible when the bond between a mother and son is unbreakable -- and two photographers joined forces to prove just that. This photo series would be thrilling on its own -- but when you learn Sarah-Jane "SJ" Staszak's story you may be compelled to reevaluate what it means to live life to its fullest. SJ was as an outdoor education instructor when her life changed forever in 2013. She underwent a low risk surgery for a bulging disc and when she woke up from the anesthesia she couldn't move. 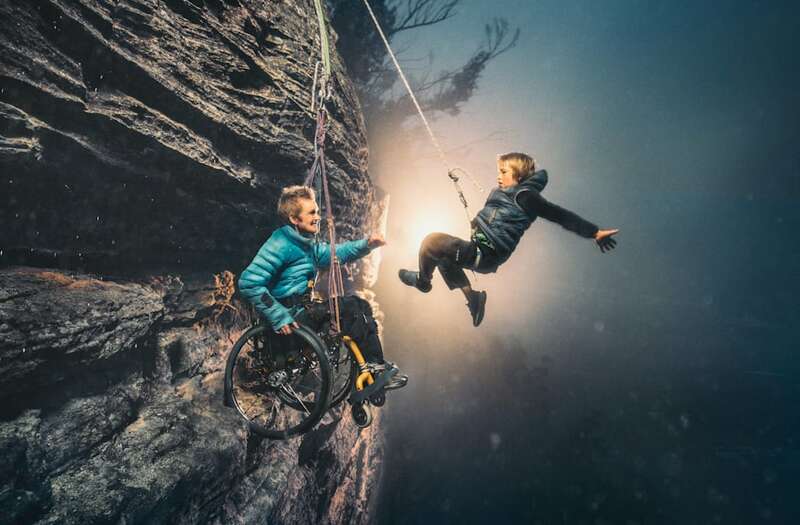 "I just couldn't imagine waking up one day and being unable to walk, let alone even hold my children," photographer Karen Alsop said. The adrenaline seeker who lived her life outdoors is now a quadriplegic -- but she isn't letting that define her life. Alsop and fellow photographer Benjamin Von Wong produced the images as part of Australia's photography initiative, The heART Project. They used their own unique styles to put SJ and her 8-year-old son, Hamish, into situations they previously enjoyed doing together like rock climbing. But they also created situations you would only find in the greatest adventure tales, with Hamish drawing striking similarities to a young Peter Pan. "I feel very special... Hamish and I loved our experience on the shoot. It was a new opportunity for both of us to be involved in such a fascinating art project and to work with such inspiring artists," SJ said. The three day shoot included both indoor and outdoor settings with Alsop using some digital magic to create her images, and Von Wong using a pulley system to suspend himself, SJ and Hamish from Australia's Blue Mountains. "I love sharing experiences with people -- and having the opportunity to connect with SJ and to get her inspiring story out there was something that was really special," Von Wong added. When the mother and son team aren't embarking on epic adventures SJ is working to increase the number of wheelchair-friendly businesses in her hometown. They were given copies of the finished images from the shoot as a reminder that life-changing moments are what you make of them -- and are often times created with the people who mean the most to you.